The CatholicTV® Network will attend the SQPN Catholic New Media Conference Saturday, October 1, 2011, in Kansas City, KS. The Catholic New Media Conference (CNMC) is a festive, educational, and international conference focused on evangelization and building community through the use of new media. The event is designed to connect, guide and inform Catholic communicators as a response to the Church’s call for new evangelization. The CNMC will host an exciting group of speakers and presenters, including Lisa Hendey, founder and editor of CatholicMom.com, and host of the KNXT Catholic Mom television segments which air on CatholicTV. Lisa will lead a workshop on Friday, September 30th as part of the Catholic New Media Guild day of workshops. 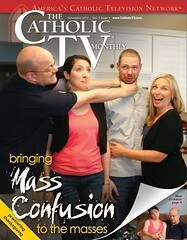 The CNMC will also offer a special preview screening of the pilot episode of Mass Confusion, a sitcom produced by the CatholicTV Network. Keynote speaker of CNMC 2010, CatholicTV Network President, Father Robert Reed, will be set to host The CatholicTV Network’s 20th Annual Telethon during the Catholic New Media Conference, broadcasting from the CatholicTV national headquarters. You can watch the pilot for Mass Confusion and all of the CatholicTV Network’s great programming on the iPhone and iPad, as well as Android devices and at CatholicTV.com. 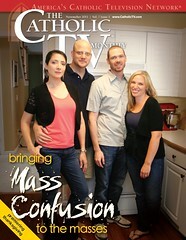 Also, see exclusive clips and pictures on our Facebook page and our online community at iCatholic.com. We're getting ready to launch our new sitcom, 'Mass Confusion' in November, but we need your help to choose which promo shot to use! Click the cover you think we should use and 'like' it for a chance to to win a free t-shirt. When we begin the new Church Year with the First Sunday of Advent, some of the words we use at Mass will change. And words are very important. While the truths of our Faith are ageless, the liturgical books continually evolve to serve us at prayer. Latin is the preferred language, not only of the Church but also in scholarship, politics, philosophy, science and the arts. The Second Vatican Council maintained the Church’s preference for Latin but also allowed for a “more extended use of the vernacular,” or common language of the people, to be used. Over the years since the Council, our use of English at Mass has helped us to pray with more understanding and to deepen the spiritual connections between the liturgy and everyday life. But still, how we speak to God must show our profound reverence for the One who made us and saves us. How we speak of God should reflect that reverence and be given greater care than the more casual way we communicate with others. Hence the call for a more literal translation of the words we use when we pray as the Church. Hosted by Mosignor James Moroney, New and Eternal Word will explain the new changes to the Missal. It premieres October 3rd.